When planning a children’s party, be sure to check out our guide to the top kids party entertainers in NY before booking your entertainment. New York is home to many talented party entertainers that will impress your guests and wow your audience. 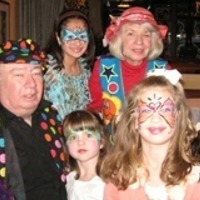 Kids will also love the top picks for party entertainers in NY featured on KidsParties.Party. Party Perfect Rentals has been in business for over a decade. With hundreds of unique inflatables, attractions and entertainment, they are your one-stop-shop for the perfect event or party in the NJ Tri-State Area. Inflatable rentals and carnival games are perfect for outdoor summer parties and township events, throw a casino night and bring Atlantic City to your party venue, ask about their various party entertainers including magicians and DJs and capture each moment with their high-quality and professional photo booths. 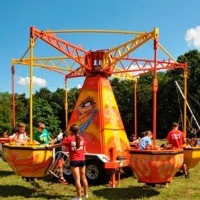 Party Perfect Rentals rents a wide variety of party equipment including dunk tanks, mechanical rides, carnival games, photo booths, crafts and entertainers. They are the preferred vendor for many schools, churches, temples, colleges and townships. They're available for all parties and events, all year long. Visit their website to view all of their products and start planning your next event today! A Party Entertainer for any Birthday Party in New York! Best Entertainment Around is your #1 source for party entertainers in NY! 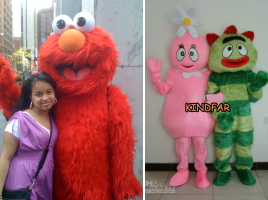 They have every kind of entertainer including Clowns, Puppeteers, Magicians, DJs, Costume Characters and so much more! 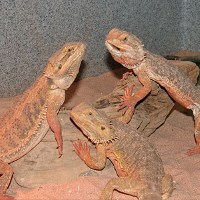 They also have party services including karaoke, petting zoos, carnival rides and more! No matter what your child's personality is, Best Entertainment Around will provide the top kids party entertainers in New York! Best Entertainment Around has provided party services for thousands of families throughout New York and the Tri-State area. Their party entertainers are dedicated, funny and the best around! 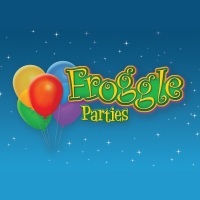 Check out their website for all of their party entertainers and party entertainment services! We serve Manhattan, Queens, Bronx, Staten Island and New Jersey. Call 201-330-1191 to book your NY party today! Kids Pick Marcia the Musical Moose as their Top Party Entertainer in NY! Premier Magician for any child's party in New York! 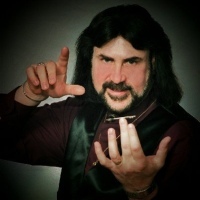 Marco is a professional magician who is experienced in performing Vegas style magic, sleight of hand classic close-up magic and is trained in the art of illusion and deception. Each illusion he performs is just amazing and simply astounding, guests young and young at heart will enjoy the show. His comedic, magic act is fit for any New York party or special event, from children's birthday parties to Bar or Bat Mitvahs, corporate events or even a wedding, he will provide each of your guests with laughter, entertainment and leave them astonished! 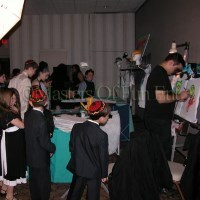 Marco will mold his act to fit your child's specific party theme or their personality! Marco is one of the top magician in New York, backed by his years of experience and his hundreds of happy clientele, both young and old. Visit his website for more information and to book your next NY event today! Every Kind of Entertainment in One Fun Company! This great party entertainment company can provide your child's next party with fun services of almost every kind imaginable. Magicians, dancers, jugglers, puppet shows, clowns, face painting, caricature artists, temporary tattoos and much much more are available when you hire these top kids entertainers in New York. Contact NY Sketches through their website for a personalized quote for your party. Though they are based in Brooklyn these entertainers can perform and serve at parties and events in all five boroughs of the city. Serving the entire NY, NJ, CT , Tri-State area, We come to you! Parties and School Programs. Celebrating our 14th Year! Seen by millions. 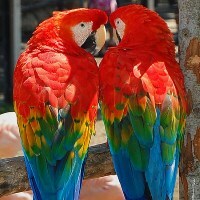 Clients include The Bronx Zoo, Newark Museum, National Geographic. Serving the entire NY, NJ, CT Tri-State area - We come to you! 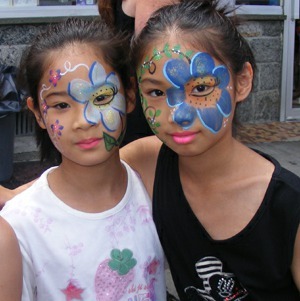 Colorful Clowns, Face Painters and More! These top children's entertainers in New York offer a huge range of services and performances that are sure to keep smiles on the faces of all your party guests. From non-scary clowns with minimal makeup and funny tricks, to magicians and balloon sculptors who will fascinate the children, you'll find something at Confetti Clowns & Characters for your child's party. Create your own custom entertainment package, or choose from a fun theme such as a Luau, Ballerina Party or Pirate Party. 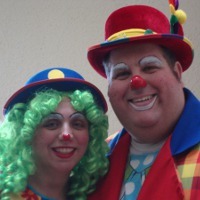 This clowning and entertainment company is family owned and has entertained thousands of children over the years. Truly a wonderful choice for your party. Have a fun, lively puppet show at your birthday party with lots of interaction and audience participation! 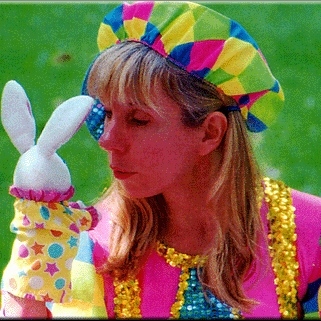 Mary Ellen Hostak is a puppeteer, storyteller, face painter, actress and stilt walker. With 20 years experience, she has worked as an entertainer for birthday parties, schools, day care centers, libraries and camps performing in her productions of The Wizard of Oz, A Dragon in the Castle, and Beauty and the Beast. 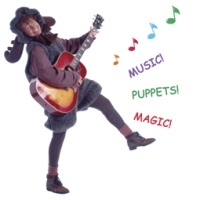 A variety of delightful Musical Puppet Shows are available for very young children. She also does colorful and glittery face painting in a many styles, including full faces, cheek art and hand painting, using professional water based face paints. For more information, please visit www.companyscomingent.com. 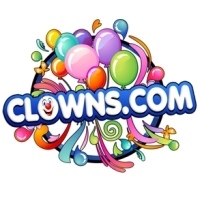 Clowns.com offers the best in kids entertainment bar none! Our professional entertainers are all aged from 21 & 29 and they all have either a degree in education or a degree in theater. We take pride in screening our party entertainers so that we know that whoever we send out there for a party, we know our clients will experience top level entertainment like they have never experienced before from a party entertainment serviced in NY. All of our entertainers go through a difficult 6 month training and screening process. We make sure that they are clean cut, courteous and are dressed in the highest quality uniforms. We own all of our costumes (we never rent costumes). This insures that our costumes are very clean and fresh with no rips, tears or stains. Please take a moment and call us at 516-577-0000 for more information about our party packages. We offer many different packages including princess parties, pirate parties, magician parties, fairy parties and of course clown parties! Thanks for reading. Sincerely the Clowns.com team. This Experienced Artist can make a real impact on Your Guests. 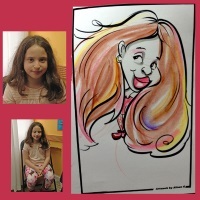 CARICATURES are both Party Entertainment and Personalized Party Favors! Alison is Energetic and Engaging while she creates her Most Unique Party Art. She is aware of the reason for the Celebration, and she directs the attention to the Guest of Honor, the Special Occasion, or the Guests whenever it works into the CARICATURE ENTERTAINMENT. Note: CARICATURE EXPRESS also offers FACE PAINTING for all Ages, FASHION SKETCHES for all Ages, GRAFFITI NAMES for all Ages, & BALLOONS for all Ages, as well as TEMPORARY TATTOOS including Both FREEHAND GLITTER TATTOOS And FLAT BLACK TATTOOS for Ages 6 through Adult. Only One Activity Per Event, except for BALLOONS which can be Added to the End of any other Type of Event if desired. Where Fun and Professionalism Meet! 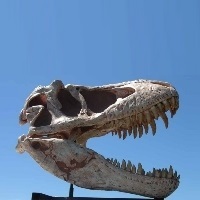 Masters of Fun has been serving New York and the surrounding area for over 24 years, spanning 2 family generations. Services they offer include custom Airbrushing, Videography, Green Screens and Photo Booth Rentals. They rent traditional wood paneled photo booths and modern marble textured booths for your unique event. The modern photo booth is appropriate for buildings with small hallways or if you're tight on space, because it can be broken down. Photos from both booths come out perfectly clear. For a truly unique photo favor idea, go with the SuperPix Green Screen! Once the professionals set up the screen, your guests simply stand in front of it to have their photo taken. Afterwards, their bodies will be superimposed onto hundreds of different backgrounds! Customized Airbrushing is their most popular service. Visit the website for all of the details on their various New York party services. Many Types of Entertainers and Add Ons for your Party! For an unforgettable party for your child, hire these professionals to do the entertainment. You'll find one of their several party packages to please your child and his or her friends, no matter their age. These top kids party entertainers NY have a large selection of balloon twisters, non-scary clowns (no makeup), glitter artists, kids comedians, costumed characters and more. For an extra girly party check out the Glamour Package which includes manicures and jewelry, or book the ultimate party package which includes a magic show with a live rabbit! 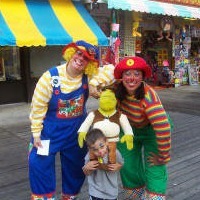 Some of the Best Kids Entertainers in New York! 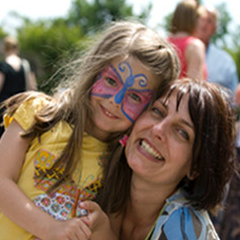 If you choose Party Et Tu to entertain at your child's party it is sure to be an event to remember. 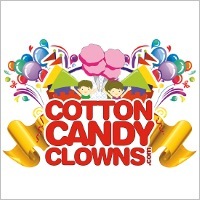 These kids entertainers offer balloon twisting in many intricate varieties, face painting and tattoos that are sure to delight and carnival games and machines such as sand art, spin art, sno kones and cotton candy. You can book your party instantly online with these top kids entertainers NY has to offer. Bring a smile to the face of each child at the party when you have great entertainment . Marty and Iris have been entertaining people of all ages at parties and conventions for many years. Their experience means they know just what to do to keep children entertained at a party. Kids love their face painting and comedy magic - that coupled with the many other services they offer makes them nearly unbeatable as entertainers. These kids entertainers can do interactive storytelling, balloon animals, sand and spin art, conduct party games, do temporary tattoos and more. Book them now, their schedule fills up fast! Offering not just clowns for your child's party but also princesses, magicians, face painting, balloon twisting and more, Speedo the Clown Agency is sure to have what you need to make an unforgettable party. Check out their special weekday rates for party entertainment! If you have a child that is scared of clowns then book a party with face painting, dancing and balloons - add on a costumed character! Speedo's clowns are part of the World Clown Association and members of Clowns of America International. These great entertainers are part of a family owned and operated business. 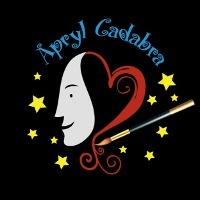 Apryl Cadabra is a clown and facepainter who has been bringing smiles to kids and adults alike for 25 years. With a lot of experience in this field you can trust that Apryl knows how to keep a room full of kids entertained. Hire her for your next birthday party and see just what she can do! In addition to her comedy show, Apryl does world class face painting for both kids and adults - she uses only FDA approved face and body paints so it's safe for all your guests. This great kids entertainer is also bilingual in English and Spanish. Call now to book her for your child's party!